This programme focuses on building capacity and movements of the most marginalised grassroots women in the region – Rural, Indigenous, Migrant and Urban Poor women. 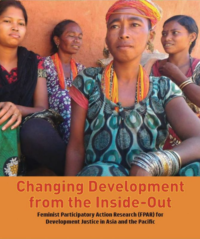 ​The programme conducts Feminist Participatory Action Research (FPAR) to document rights violations, collectively craft solutions and advocacy strategy for change at local, national, regional and international levels. We work to support rural, indigenous and migrant women become vocal and effective advocates, enabling them to influence policies and practices that relate to their rights over land, resources, decent work, peace and democratic participation. Asia Pacific comprises two thirds of the world’s poorest people, the majority of whom are women. Rural, indigenous, migrant, and urban poor women are routinely exposed to further marginalisation and human rights violations. Women who depend on land and resources without secure rights and women who have no access to land resources or assets, are particularly at risk. Women’s rights and autonomy over their bodies and lives are increasingly threatened, due to escalating fundamentalisms, climate change, environmental degradation, militarisation, and discrimination. Moreover, women are the overwhelmingly targets of sexual and gender-based violence while marginalised groups have no access to legal remedies and the vast majority are forced to work in a globally dysfunctional economic system that further exploits them in the name of development. Women from these most marginalised communities are rarely engaged in policy making locally, nationally or internationally. Our work focuses on increasing the capacity of marginalised women to advocate for for their rights to access and control over resources, decent work, peace and democratic participation. Through women’s organising, they may be able to gather evidence and mobilise and further, to engage policy makers and advance rights-based policies.